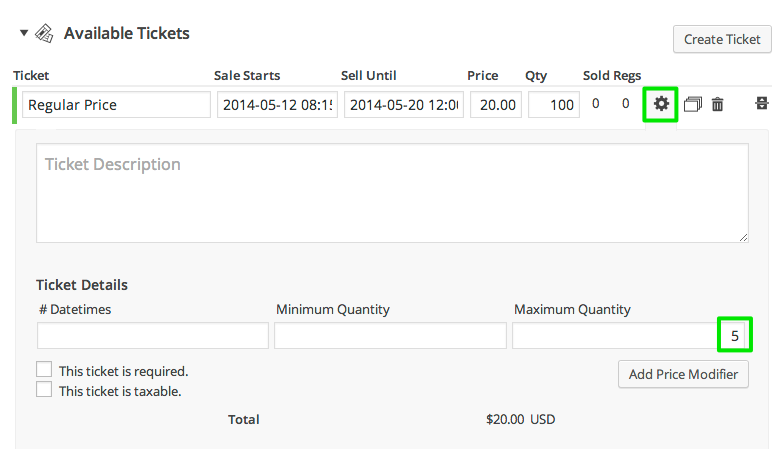 Starting with Event Espresso 4.3 you can offer graduated pricing based on ticket quantities. This article shows how to set graduated ticket pricing where you can set a lower price per ticket for larger quantity ticket purchases. One advantage of graduated ticket pricing over ticket bundle pricing is the quantity selection can be more flexible. In the Event Tickets & Datetimes section of the Event Editor you create or edit a ticket and click the gear icon. This will open a panel where you can set values for the Minimum Quantity and Maximum Quantity to the same non-zero value. When the Minimum Quantity and Maximum Quantity fields in the Event Editor are set to different values, then the price displayed in the Ticket Selector Price column will be per ticket. This is how price displays for regular tickets. 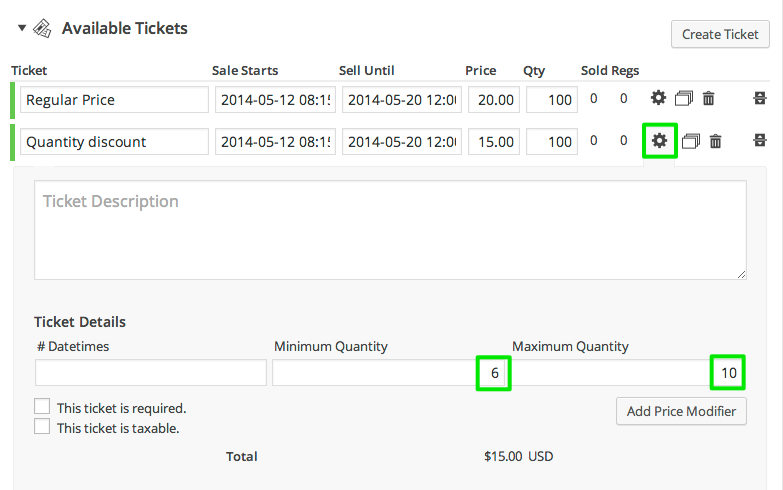 In this example we leave the Minimum Quantity field blank and Maximum Quantity field to 5 to create a “regular” price for ticket quantity purchases between 1 and 5. The regular price is set to $20.00. We create a second ticket where a discounted price of $15 per ticket is applied for orders of 6-10 tickets. 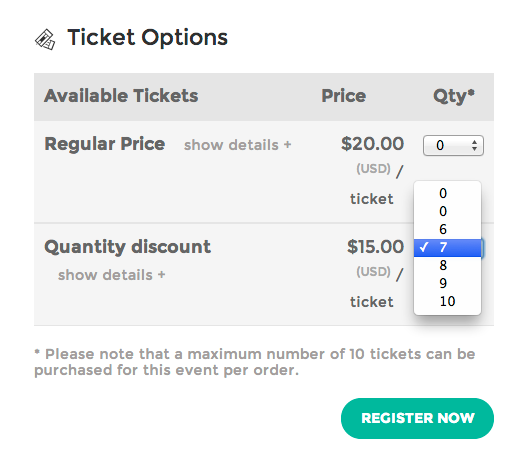 The Price QTY dropdown select box in the Ticket Selector will then display a range of options, beginning with 0 then jumping to the tickets Minimum Quantity, then incrementing by 1 until either the Maximum Quantity or Maximum Registrations limit is reached.